Here’s another find from last year – this one was recovered during a site inspection for some work near Doolin, Co. Clare. It was found by Billy, lying in plain view on a sandy bank beside a limestone pavement. 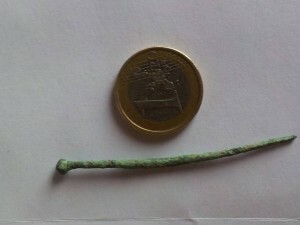 It’s a copper alloy pin with a slight bend at the head and another along the shaft. The pin is likely to date from the 10th to the 12th century AD. Stick pins like this one were usually used to fasten cloaks. The pin was found near Ballaghaline Point where an excavation was carried out in 1996, where ‘the remains of what may have been a site of archaeological importance were reported to be eroding into the sea’. The site had been described as a ring of small slabs set on edge, with earth and stone in the centre. A cylindrical bone bead with incised decoration was retrieved from the surface of these clays during the initial site investigation by the excavator. During the excavation some animal bone was recovered. A few tiny fragments of burnt bone were also recovered, but no other artefacts which might throw light on the date or function of the site were retrieved. 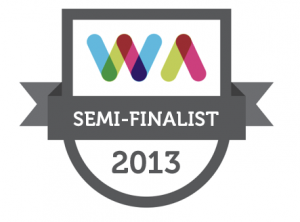 This entry was posted on Wednesday, September 12th, 2012 at 1:31 pm. It is filed under Finds, Virtual Museum and tagged with Archaeologist, Artefacts, Copper alloy stick pin, finds, galway, late medieval. You can follow any responses to this entry through the RSS 2.0 feed.